I use Sony a6000 as my primary underwater camera. It is 24.3MP so I can easily compose in editing. The kit lens is sharp and shoots wide. The Sony shoots in RAW, necessary for white balance and editing after the fact. It has very fast autofocus which can keep up with my subjects as well as three continuous shooting speeds. But, the primary reason I went with the a6000 over any other model was because I was able to purchase an underwater hard case for the camera for around $200. I selected the Neewer 40m/130ft Underwater Housing. Amazon also has an identical Meikon branded case. They are not too bulky, but with this case, the camera must be used in live view (Monitor-only mode) as the case triggers the sensor next to the viewfinder. It has easy access to all the controls and comes with a sensor that lights up and squawks if any moisture gets into the case. It is very well built and secure. I’m not going to be focusing on the design of the case in this article, but how I use it. There are a few downsides to this case. Unlike a lot of expensive underwater cases, The Neewer case doesn’t have a domed glass front. This becomes a problem when water beads don’t roll off the glass. As you can see in these images, the water droplets are highly visible when combined with the glare from the setting sun. 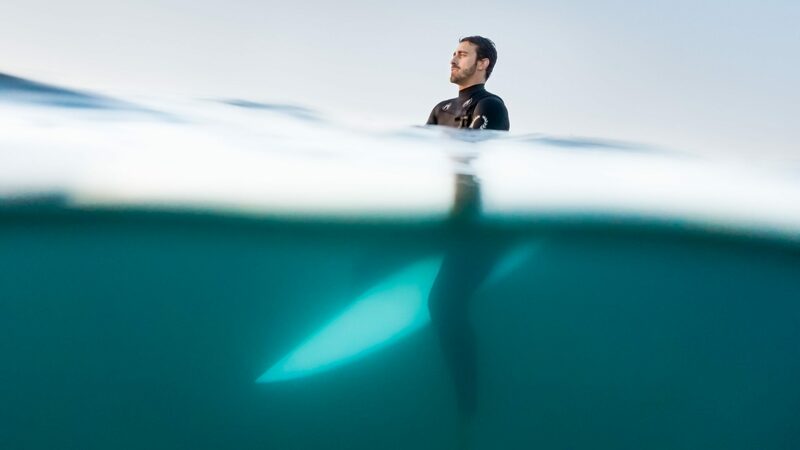 Since I primarily shoot fully underwater, this typically isn’t a problem, but it became one when I was doing surf photography. A simple solution is to spit on the glass and wipe. For these images, I didn’t mind the flare of the water combined with the sun, but if you require really clean images at the surface of the water, this case might not be the ideal solution. The a6000 has a more sensitive Autofocus than I have grown used to with my Canon bodies used in live view. It is a struggle to use the camera with certain autofocus modes while on the surface of the water. I thought automatic or continuous autofocus would be the way to go, with the wide or zone focus areas selected. I was wrong. With the Sony a6000, it was so very good at picking up the waves in front of my subject, and not the surfer. I had to adjust my settings to Continuous AF, but with the focus area set to a flexible spot. I got used to framing my subject in a certain way to catch that spot. It wasn’t impossible to change focus points in the water, but it wasn’t easy. I would keep my images composed using the same point for a few minutes at a time. Once I nailed down those few changes, I feel very comfortable and confident that I can get quality images using the a6000 and the Neewer case in the surf. For an entire set up at less than $900 total, I really couldn’t be happier. I don’t dive deep, and I don’t need to use external lighting control with my underwater work. So, I’m willing to put up with the few downsides to this combination as the quality combined with the price can’t be beat. Erika is a San Diego based photographer with a lot of verve. As a photographer, her goal is to make images her clients will treasure; to still be hung on a family’s walls in 50 years as gifts and heirlooms.As a person, her goal to discover something new each day. Erika loves to share her knowledge, boundless energy, ideas and enthusiasm with her clients, her students and her peers.To learn more, visit Erika's portfolio or blog. I like the effect of the water on the front of the lens. These are so pretty. I would love to add this camera to my bag! I like a lot the sony a6000 underwater case, it takes amazing pictures. I love how the picture of the surfer with his surfboard; you can see the sea with the board underwater and above you can see the surfer seat in the board. It’s one of the most amazing photos i have ever seen. I love the blur of underwater with the surfboard. I think that the sony a600 with the underwater case is one of the best cameras because the quality for underwater is perfect. Erika i think that for being 200 euros the underwater case it’s perfect for doing photos in water. I determine that it better that doing it with a gopro or any type of action camera. One of the things that i most like of the photo is how the sunlight reflect is in the camera and you can see the big wave and the clear sky. And you can also see the turquoise sea because it’s awesome in a surfer picture. I really like that for being an autofocus it only determines the surfer with his board.